If you already know how to make raisin pie or if you are just learning, you may not know how it originated. This is an old fashioned type of pie mainly due to the availability of the ingredients. Most cannot remember back before we had refrigeration. Even I, at my age, cannot remember a time when our family did not have electric or refrigeration. I do know that most of my older siblings did experience living without electric and refrigeration was done by “ice boxes”. NOTE: Large chunks of ice were delivered every couple of days to be placed in ice boxes (insulated boxes) to keep necessities cold. Mom learned how to make raisin pie when no fresh fruits or green tomatoes were available. We always had raisin in our supplies and so did almost all homemakers. Dried raisins have a long shelf life so we always had them on hand. I remember all my little friends ate raisins as a snack; we were not allowed. Mom kept our raisins only for cooking because she thought they were too high in sugar for snacking. I remember years later doctors started reporting that so many children had bad teeth because they snacked on too many raisins. Mom was right again! Some of you, like me, might have the family tradition of preparing food for others for special occasions. One of these most important times is when families and friends are gathering for funerals. Often the people involved are too stressed, saddened and busy to remember to eat. Today I often prepare casseroles and desserts for these times but years ago these ingredients possibly were not available. Dried raisins were always available. Most cooks learned how to make raisin pie to take to these gatherings. The raisin pie was so popular and common that a simple raisin pie became known as the “funeral pie”. If you know how to make raisin pie you know how many different ingredients are now used in the recipes. When this pie originated ingredients like milks, creams and sour cream were not available. Pies containing these ingredients also need to be refrigerated after preparing so that was not possible back then. The original and most today are made in a simple flour pie shell. Originally the raisin mixture was placed in the shell, covered with a top crust and baked. Today, cooked fillings might be placed in a baked crust, cooked filling in unbaked crust or uncooked filling in an unbaked crust and then baked. Since I learned how to make raisin pie I have collected many recipes. I am sharing some of those with you below. I love the ones with sour cream. I like them better when cold. When they are warm they are very rich to me. For your convenience when learning how to make raisin pie, I am adding a simple double crust pie dough recipe. Combine flour and salt in bowl; cut in the shortening. Measure the vinegar and add to milk; stir into the flour mixture. Knead on a floured surface until smooth; makes a double crust or 2 single crusts. Combine sour cream, sugar, salt, cinnamon, ginger, cloves, eggs and vinegar in mixing bowl. With mixer on medium beat until smooth and blended; with spoon stir in raisins. Pour into prepared pie shell; bake about 45 minutes until set. Learn how to make raisin pie made with sour cream, cream cheese and whipped cream. Delicious! Combine in a saucepan the raisins, sour cream, eggs, butter and spices. Bring raisin mixture to a boil over medium heat. Cook and stir mixture until thickened; cool completely. Combine and beat the cream cheese and powdered sugar until well blended. Fold in the whipped cream until well blended. Spread HALF of cream cheese mixture in bottom of cold baked pie shell. Spread raisin mixture over top of cheese mixture. Top with remaining HALF of cheese mixture; chill and garnish if desired. Learn how to make raisin pie topped with Cool Whip. Combine and beat the sugars, flour, eggs and ½ cup of water; set aside. Combine raisins and 1 cup water in saucepan; bring to a boil. Add sugar mixture to hot raisins; cook until thickened. Remove mixture from heat; stir in the butter, lemon juice and vanilla. Cool to room temperature; pour into baked pie shell and refrigerate. To serve top with Cool Whip; serves 8. Combine and blend egg yolks and remaining ingredients in a large heavy saucepan. Cook and stir over medium heat until thickened; cool to room temperature. Pour into prepared pie crust; top with meringue OR serve cold with whipped cream. Learn how to make raisin pie more like the old fashioned way. The old recipe likely had a top crust and may or may not have included nuts. Combine and mix eggs and remaining ingredients until well blended. Bake 30 minutes or until center is set; cool. Serve warm or cold; serves 8. 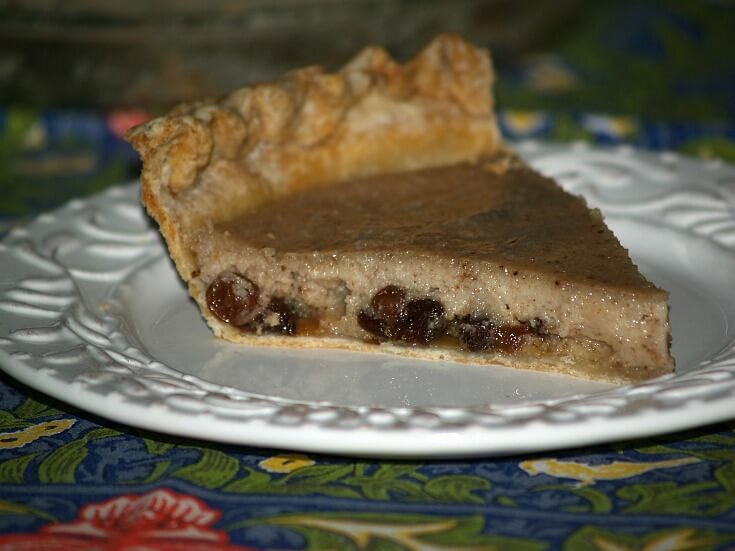 Learn how to make raisin pie with this “holiday recipe” or some may call “Japanese raisin pie”. Combine and mix the melted butter and remaining following ingredients until well blended. Pour into pie shell; bake about 40 minutes until center is set. Serve topped with ice cream or whipped topping if desired; serves 8. Combine sugar, cornstarch, salt and cocoa powder in a heavy saucepan; gradually stir in milk. Cook and stir over medium heat until bubbly; cook and stir 2 minutes longer. Remove pan from heat; stir some of hot mixture into beaten egg yolks. Return yolk mixture back into pan of hot mixture; stir and cook for 2 minutes. Pour mixture into baked pie shell; spread meringue (Recipe below) over the filling. Bake about 15 minutes until meringue is golden brown. Beat egg whites with cream of tartar and vanilla until soft peaks. Gradually add the sugar beating until stiff peaks form; spread over hot filling. Roll half of dough and fit into a 10 inch pie pan. Place half of apples and half of raisins in pie shell. Combine and mix flour, cornstarch, nutmeg, brown and white sugars. Sprinkle half of the sugar mixture over the apples and raisins in pie shell; dot with butter. Repeat with remaining apple slices, raisins and butter; top with remaining flour mixture. Roll remaining dough and top pie; cut slits for steam and seal edges. Brush top with cream and sprinkle with 1 tablespoon sugar. Bake 40 to 45 minutes until apples are tender. Remove pie from oven; spoon rum through the slits in the top crust. Butter a large pie pan: set aside. Place chocolate and butter in heavy saucepan over low heat until melted and smooth. Add eggs, sugar, flour, vanilla, raisins and pecans to melted chocolate mixture. Stir mixture until completely blended; pour into prepared pie pan. Place pan in cold oven; TURN OVEN ON to 350F degrees. Bake for 30 minutes; cool at least 10 minutes before cutting. 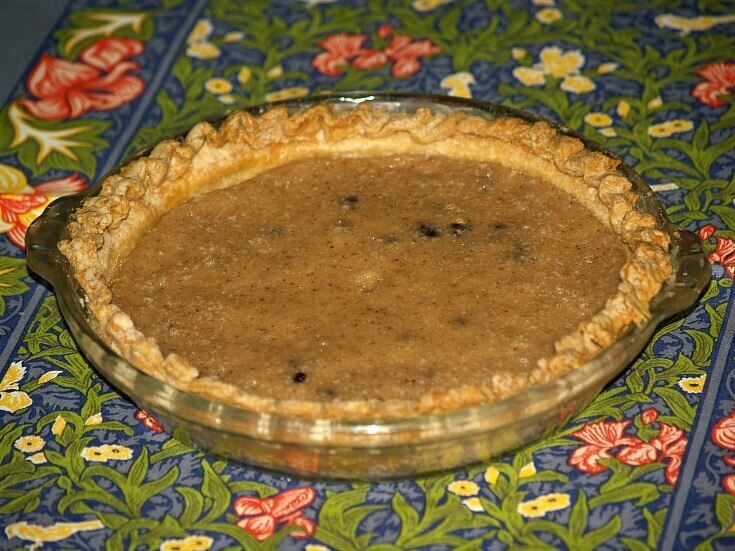 Learn how to make raisin pie filling for 2 pie shells. Place raisins in saucepan, cover with water; bring to a boil and then drain. In a large bowl combine raisins, sugar, butter, eggs, vinegar and nuts; stir to blend. Divide raisin mixture evenly between 2 pie shells; bake 35 minutes and cool. In mixing bowl beat together 2 eggs and 1 cup sugar; gradually stir in sour cream. In separate bowl combine flour, salt and spices; stir in the raisins and add to the raisin mixture. Pour mixture into pie shell; bake for 10 minutes. REDUCE OVEN TEMPERATURE TO 350F degrees; bake 15 to 20 minutes longer. While pie is baking prepare meringue beating 2 egg whites gradually adding 3 tablespoons sugar. Beat until stiff and spread over pie; bake 10 minutes longer until meringue is light brown.